Halloween is right around the corner, which means many of you are preparing for the tricks and treats of the holiday. 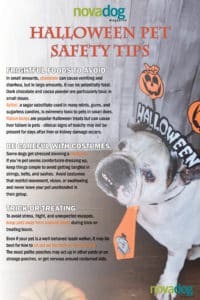 While kids and adults alike love getting into the Halloween spirit, seasonal festitivities can be downright stressful and even dangerous for our pets. 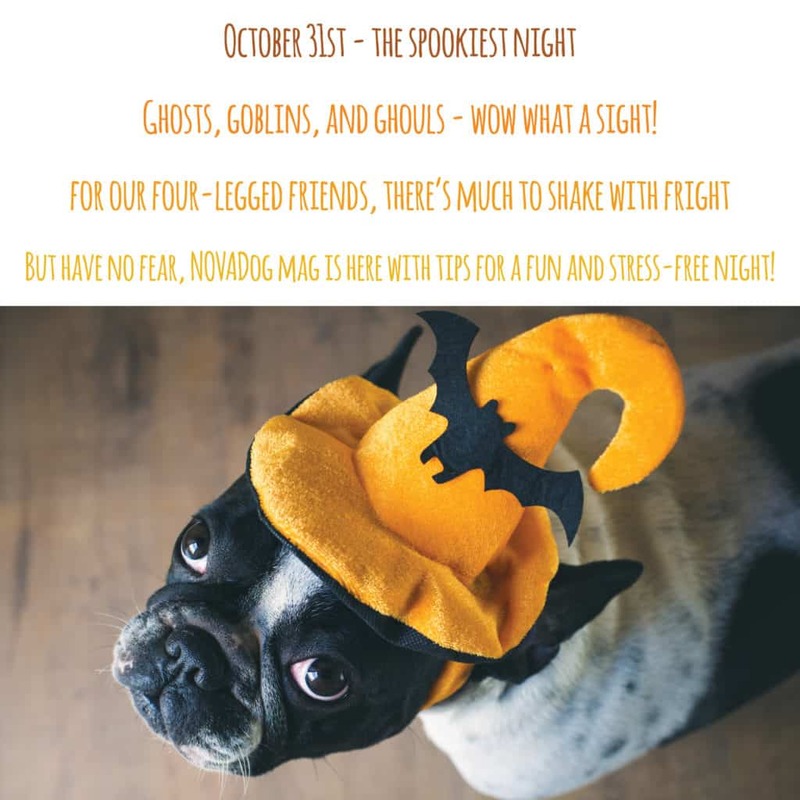 Learn how to keep your pet safe and happy this Halloween night. Unfortunately, a favorite Halloween treat among us humans can be very harmful to our pets. In small amounts, chocolate can cause vomiting and diarrhea, but in large amounts, it can be potentially fatal. Dark chocolate and cocoa powder are particularly toxic in small doses. Even if you don’t plan on sharing those delectable mini-chocolate bars, remember, many dogs are attracted to chocolate’s dark, rich aroma and will seek out your treat bucket. It’s best to keep the sweets out of your pet’s reach or in a cupboard when not noshing. Xylitol is a common ingredient in many gums, mints, sugarless baked goods and candies, human dental care products, and some peanut butters. A sugar substitute, xylitol, is extremely toxic to pets. Just one to two pieces of sugar-free gum can cause life-threatening hypoglycemia, seizures, and liver failure. 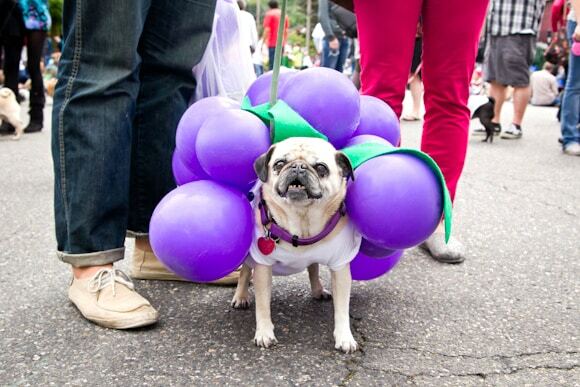 Raisin boxes are a popular and healthy Halloween treat, but raisins can cause severe liver and kidney failure in pets. Clinical signs may not show up for several days after damage to the liver and kidneys has already occurred. 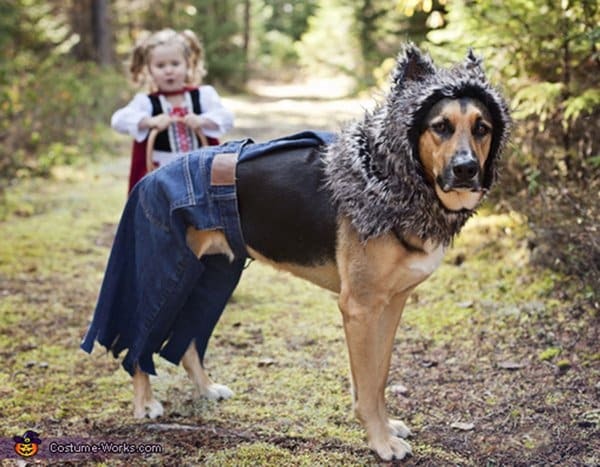 While the pooches above look super cute and happy, many pets don’t like dressing up. Unless your pet regularly wears clothes and you know they feel comfortable in a getup, use caution with Halloween costumes. Keep things simple to avoid tangles or injuries in strings, belts, and sashes. 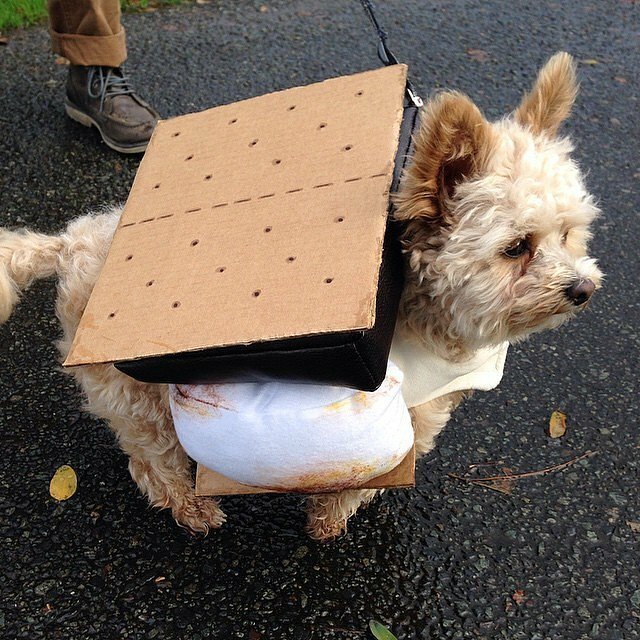 Avoid costumes that restrict movement, vision, or swallowing and never leave your pet unattended in their getup. If your pet shows signs of stress, anxiety, or pain, remove the party apparel pronto! Even if your pooch is the most well-behaved leash walker, it may be best for him to sit out on the trick-or-treating trek. Normally polite dogs could act among the sights, sounds and smells of strange yards and porches or be frightened or nervous by costumed Halloweeners and rowdy kids. 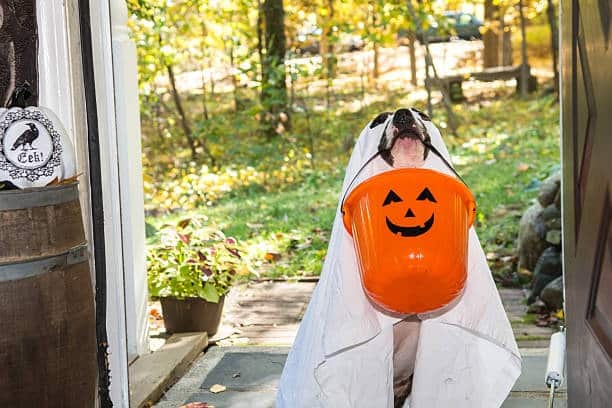 At home, avoid stress, fright, and unexpected escapes by keeping your pet crated or in another area of the house during trick-or-treating hours.